The kids, Imran especially, had been begging and bugging us for pets. Judging from our previous experience, having cats was out of the question. So we bought them fish. They were absolutely elated. 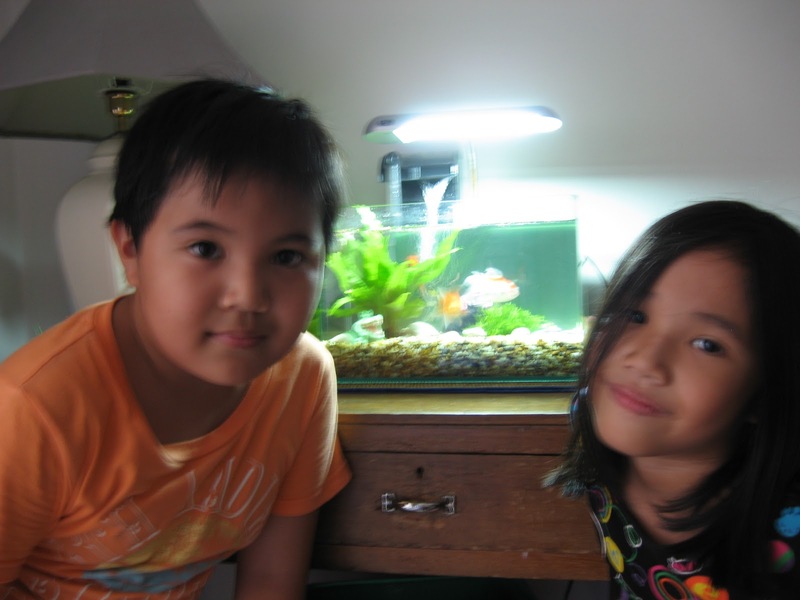 They helped me choose the fish, tank and decorated it with their favorite toys. 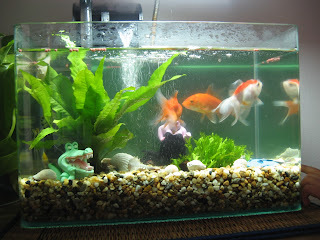 Even the sea witch (from Little Mermaid), tick tock crocodile (from Peter Pan) and Dory (from Nemo) ended up in the tank. They even named the fish with some funny, rhymy names. I feel having pets is a great way to teach kids a sense of responsibility. They have been very good in feeding the fish and cleaning the filter. So far, the mortality rate is not bad. Only two fishes died. One of them, a sucker fish, actually mysteriously disappeared from the tank. We suspected that the gold fish as the culprit!